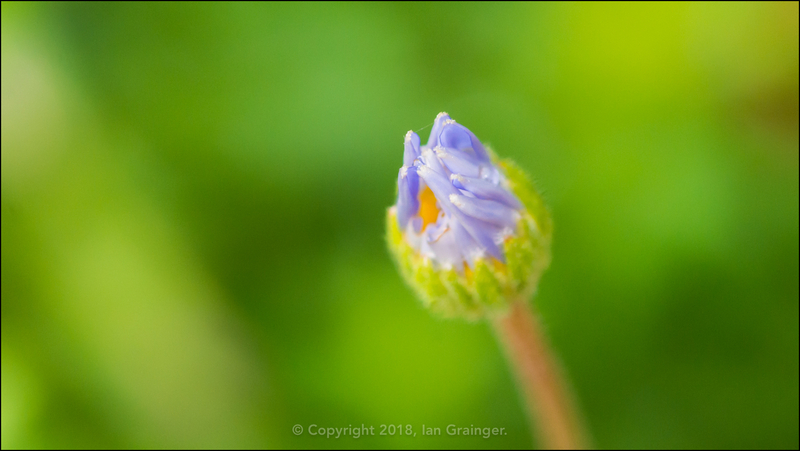 This week I'm kicking off with images from my own garden. There isn't an awful lot going on at the moment, but there are a few highlights. 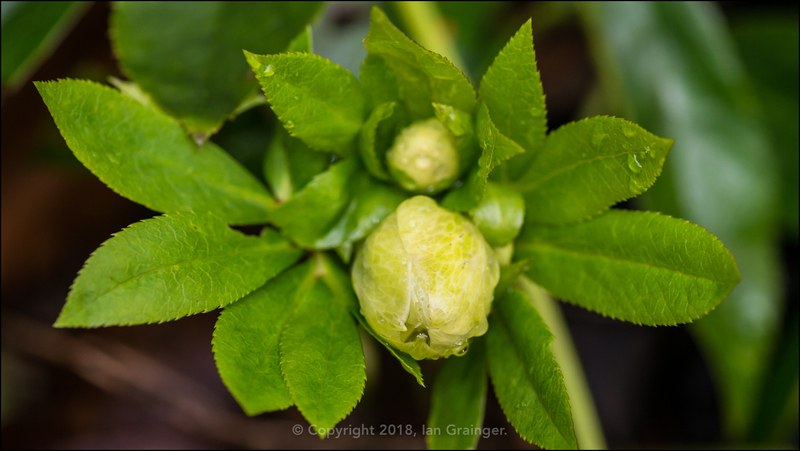 The first of which is a surprise package in the shape of some of my Felicia (Felicia amelloides) plants, which look like they're going to start flowering again. 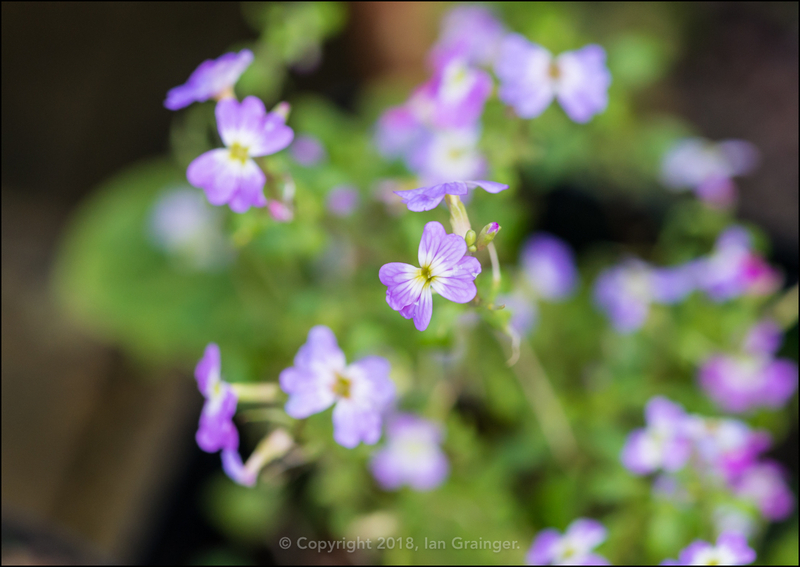 Another surprise greeted me when I looked into a sheltered corner and found these pretty little Virginia Stock (Malcolmia maritima) blooms, which seem to have defied wind, rain, frost and snow. ...and this yellow one surely not far behind. 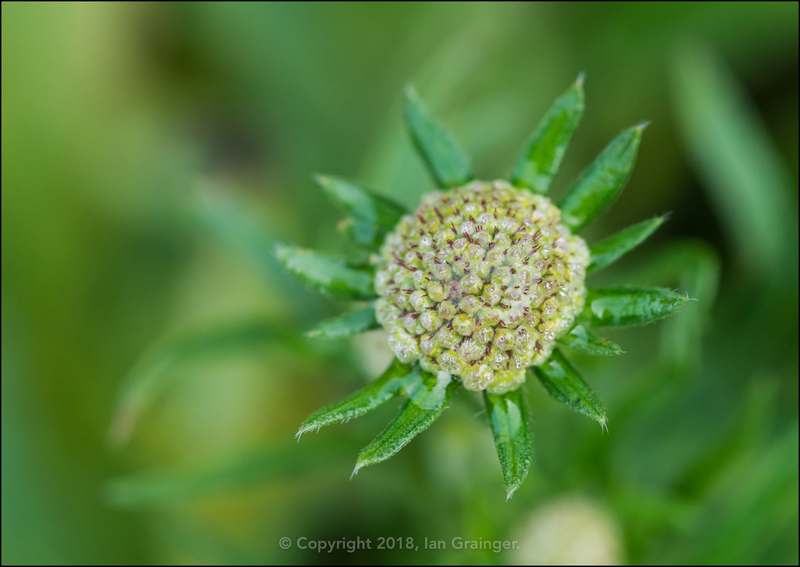 It was back to the surprises though when I spotted this Scabious flower bud, set to burst into bloom. 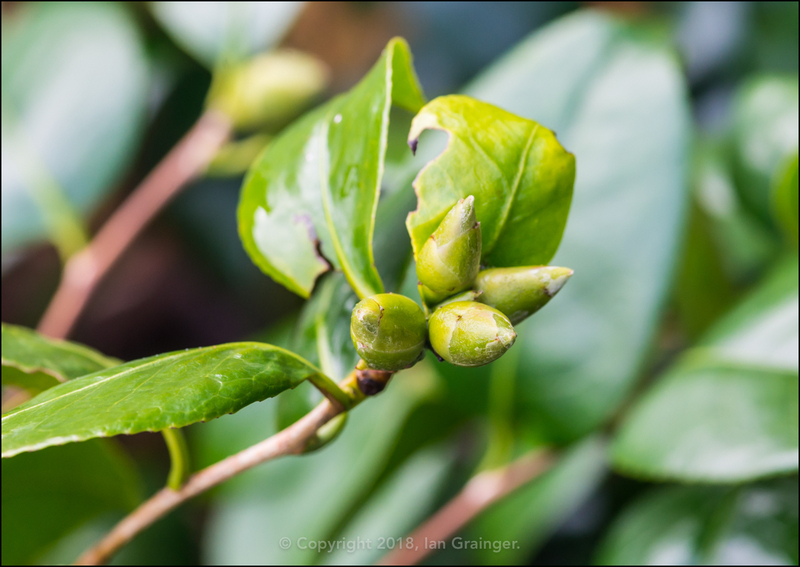 I definitely thought the frost had put the plant to sleep until Summertime returned. 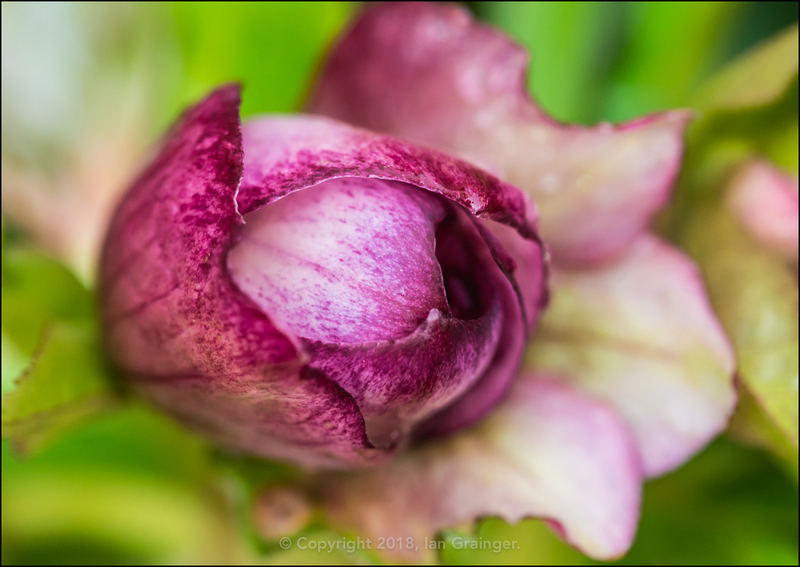 Like the Christmas Roses, my Camellia bush was also behaving itself, and would be flowering when Springtime returned. 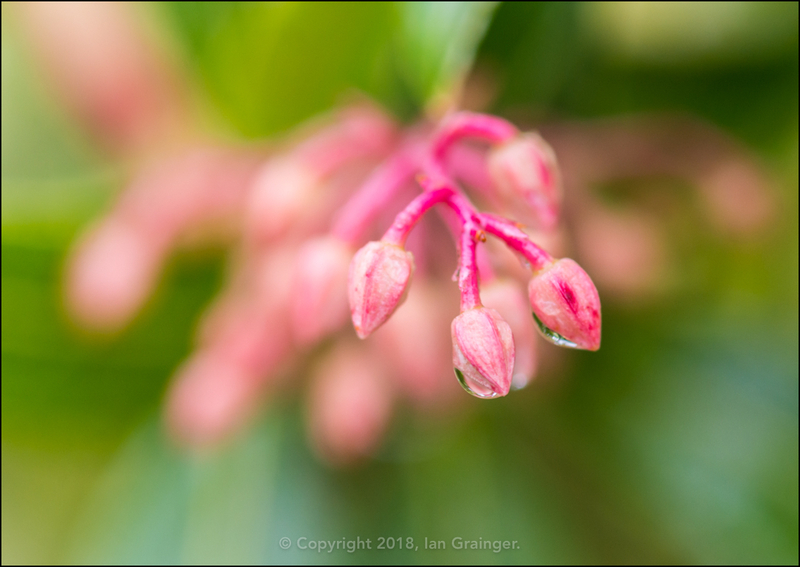 I was lucky to get these shots without getting drenched, as the view of my garden has pretty much looked like this so far in 2018! Hence, there wasn't much point in pointing my camera lens skywards, as the weather had been atrocious and dominated by rain. 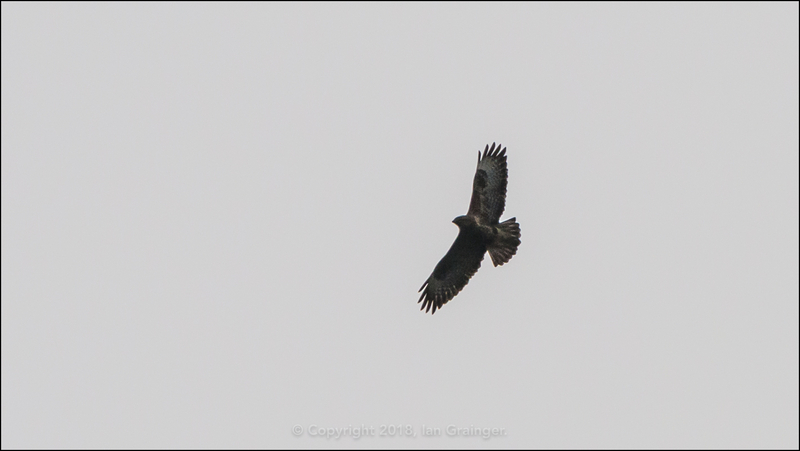 However, during a brief dry spell I managed to catch this Buzzard (Buteo buteo) soaring overhead. 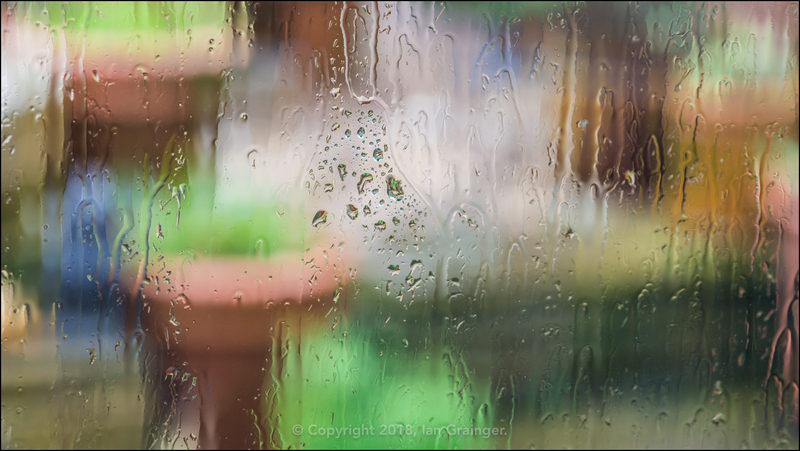 Over in dad's garden last weekend, where I normally have my weekly photo shoot, it didn't stop raining at all, which meant I got very wet, and only managed to grab a handful of images. 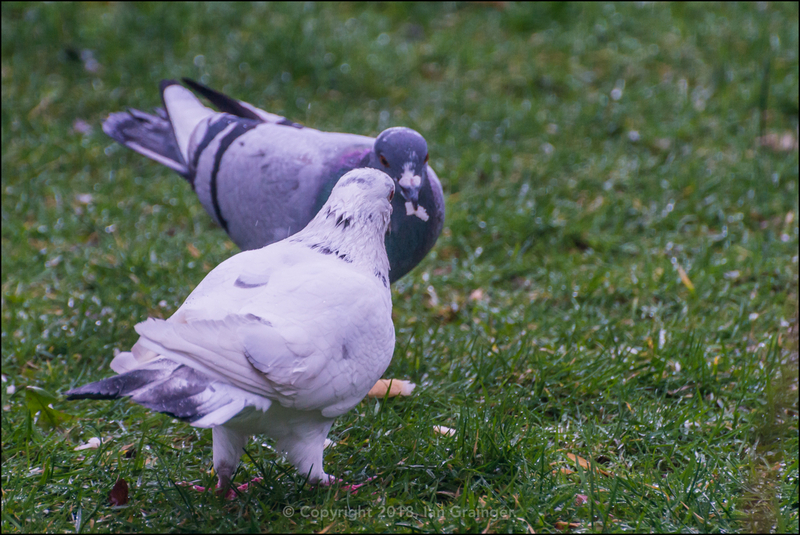 This one was actually taken from indoors, and I quite liked that it looked like the two Feral Pigeons (Columba livia) were enjoying a meal together. 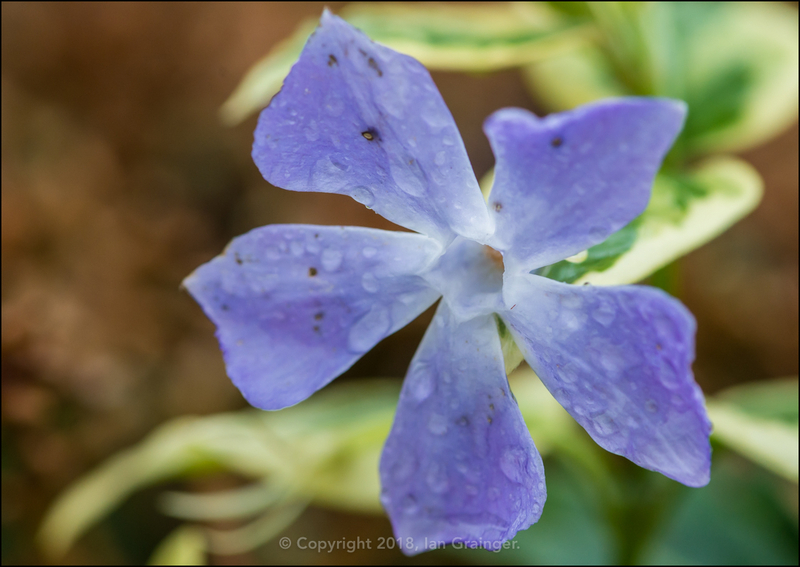 The pristine Periwinkle (Vinca) bloom that I posted last week had taken a bit of a beating by the weather, and was looking a bit worse for wear. 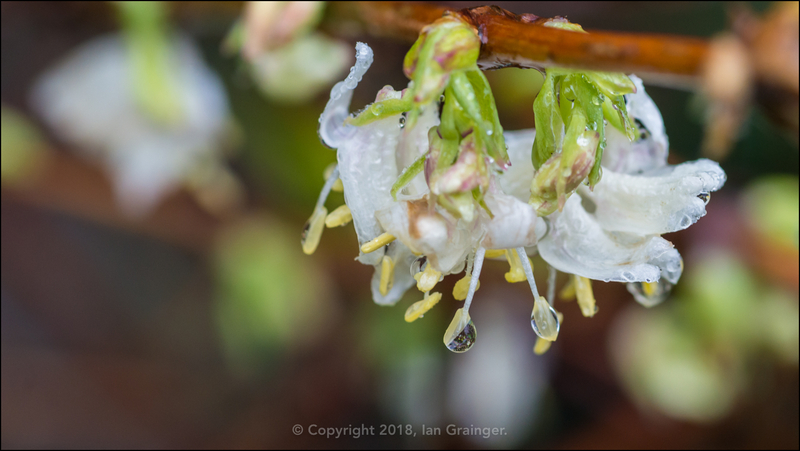 ...just like the Winter Honeysuckle (Lonicera fragrantissima) blooms had! 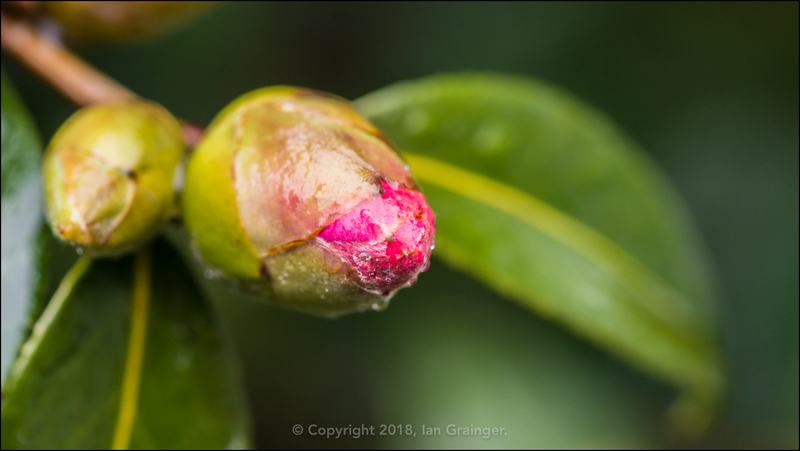 So far there'd only been one bud open on the large Camellia bush, but there were plenty of buds poised to explode, given the right conditions. 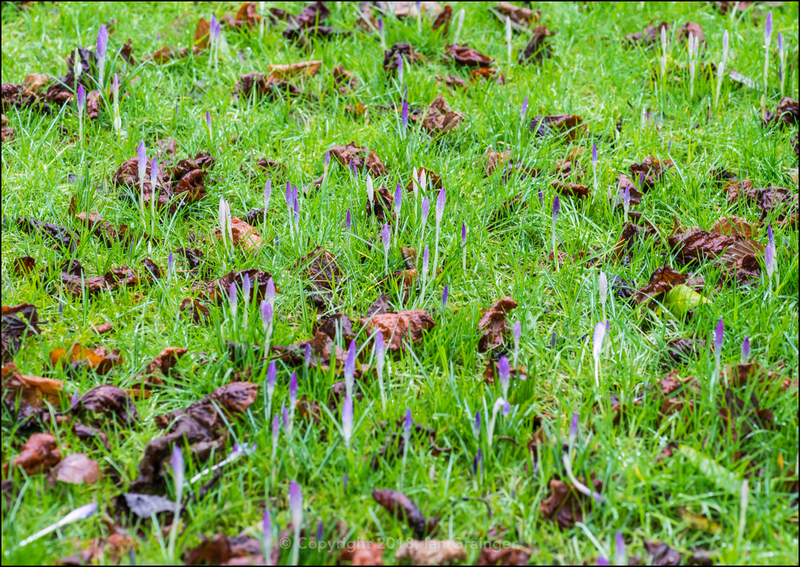 The same was true of the masses of Crocus, standing to attention in the lawn. Just a couple of hours of sunshine would have done it, but they're all likely to get battered by the next storm before that happens. 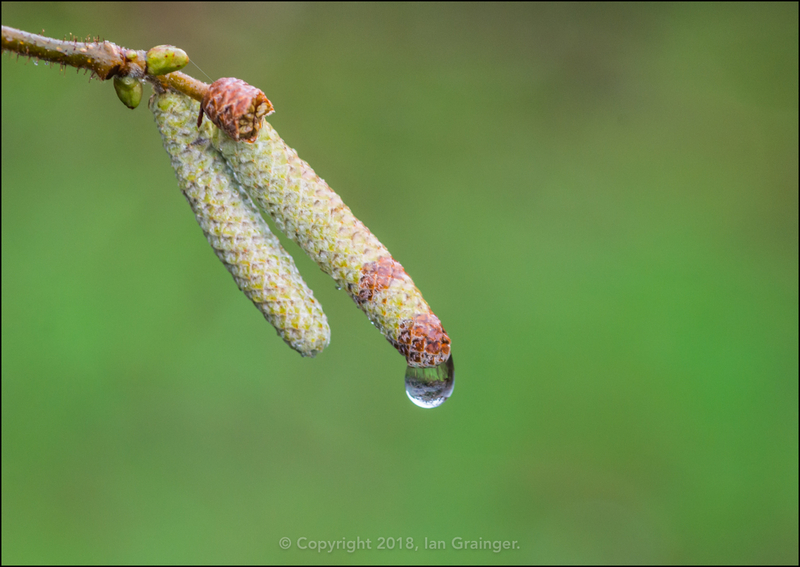 The Catkins of the Twisted Hazel (Corylus avellana Contorta) were also waiting patiently to unburden themselves of seed. Finally, a fishy photo, and it's another one from last year. 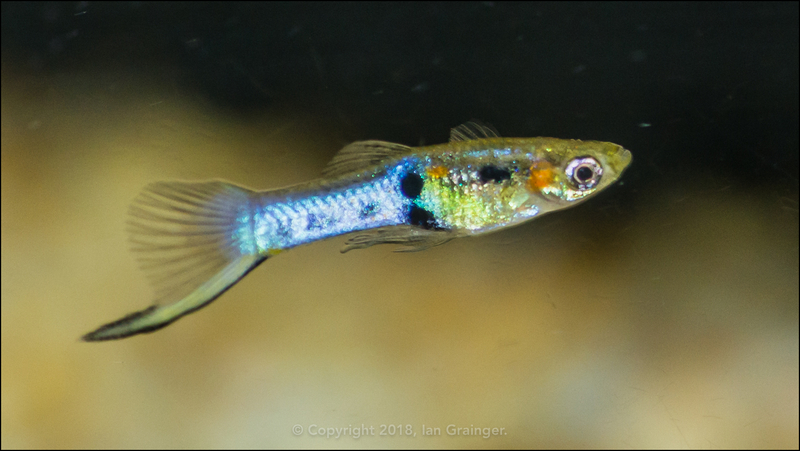 This is Elvis the Endler (Poecilia wingei). I've posted about him before, so if you want to see why he's called Elvis, you can read about it here.